Walking Trek In Rila And Pirin Mountains, Bulgaria. Guided Mountain Trekking Tours. Enjoy Bulgaria’s most picturesque alpine treks, climbing the Balkans’ tallest summits: Musala (2925m/9596ft) in the Rila and Vihren (2914m/9560ft) in the Pirin. Our route crosses huge national parks with broad alpine meadows and serrated summits, glacier lakes, stone rivers, encountering rare plant and animal life. The programme includes a visit of the Rila Monastery, listed by UNESCO and one of Bulgaria’s best-known sights. The walking treks are rather arduous and suited to very fit people experienced in alpine walking. 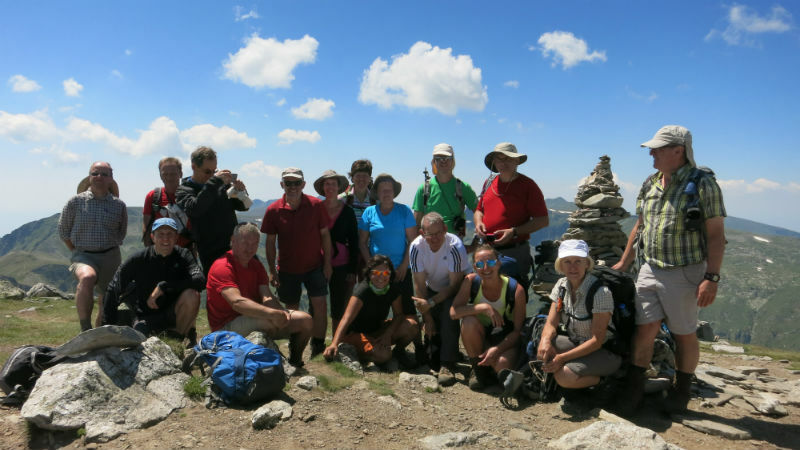 The hiking programme is based in two centres (one each in the Pirin and the Rila), allowing the routes to be additionally adapted to group specifics, and to be undertaken with only a small backpack with a day’s supplies of water, food, and clothing. There are sufficient alternative walking routes in case of bad weather. - Pirin Mountains are the country's second highest mountain, considered also the most beautiful one. One can find here more than 170 glacial lakes and a large number of rare plants, including the edelweiss and the famous Baikusheva Fir, the latter almost 1,300 years old. - Rila Mountains are the sixth highest in Europe, coming after the Caucasus, the Alps, Sierra Nevada, the Pyrenees and Mount Etna. The name Rila is allegedly of Thracian origin and is thought to mean "well-watered mountain", owing to Rila's abundance of glacial lakes (about 200) and hot springs in the faulty areas. - Rila Monastery is one of the most remarkable monuments on the Balkan Peninsula equally for its size, natural surroundings, architecture, wall paintings and ancient history dating back to the 10th century. Day 1: We meet you at Sofia Airport and transfer you to Bansko at the foot of Mount Pirin. Day 8: Transfer from Govedartsi to Sofia Airport. Accommodation: three-star (Bansko), tourist class/basic hotel (Panichishte) and family hotels (Govedartsi); double/twin rooms with en-suite facilities everywhere; breakfast and supper included. The price includes: accommodation and boarding as mentioned above; transfer to/from Sofia airport; English-speaking guide and private transfers throughout the tour; lift tickets; VAT and all local taxes. The price does not include: maps (could be requested in advance when booking the tour), other meals, drinks, entrance fees, tips, personal expenses, travel/medical insurance.